Author's Note: This article was written a full week before last Sunday's meeting between Sen. Graham and President Trump where they discussed a "possible" reevaluation of our troop withdrawal from Syria. Let me start by saying that I support President Trump one hundred percent even if I do not personally agree with every decision he makes, and that I will wholeheartedly support him in 2020. With that said I must admit that at this point in time I disagree completely with his decision to pull out the two thousand American ground troops currently stationed in Syria. And what's even more surprising is that I find myself agreeing with now former Secretary of Defense Gen. James Mattis, the very man I believe was and might still be to some degree an islamic sympathizer as was and probably still is former National Security Advisor Gen. H.R. McMaster...I've even written articles to that affect and here is but one: The Manipulation of Willful Ignorance. However, I have always stated that Gen. Mattis is a great military tactician and strategist, logistics wise, and in the case of Syria he truly understands that by withdrawing American troops at this particular time leaves open the likely possibility that not only will ISIS regroup and become even more powerful and far-reaching than they were before our withdrawal...sort of like they did when Obama prematurely pulled us out of Iraq in 2010...but that a dangerous situation will be created where both Iran and Russia will become the dominate political force within the Middle East...an area we can ill-afford to lose what with Iran on the verge of becoming a nuclear power...and don't let anyone try to fool otherwise. And if it wasn't for Iran stirring the pot in Syria, ISIS would not have made the inroads that they did and Bashir al-Assad's secular government might still be in somewhat unopposed control...as in no unchecked mass migration would have occurred and Syria's Christians would still be able to worship as they so choose. And while that is a truth President Trump might see he still refuses to acknowledge that Iran alone is the true ground zero of all current Middle East contention. Destroy the Iranian islamic regime...with Israel's help of course...and ISIS and other terrorist groups will fall for with Iran gone so goes their chief source of funding. But this latest political brouhaha...which came to a head on December 19th with Gen. James Mattis resigning his position as Secretary of Defense...seems to have started back on December 14th when President Donald Trump reportedly received a phone call from Turkey's President Recep Erdogan, and suddenly our president decides to now withdraw all U.S. forces from Syria and transfer the responsibility of combating insurgents in Syria to Turkey...a fellow NATO member. Now going against Mattis, the military experts, and the generals on the ground's advice not to withdraw from Syria, Trump tweeted that, “We have defeated ISIS in Syria, my only reason for being there during the Trump Presidency.” This was a huge mistake as was Trump's even speaking to Erdogan, and from there, in my opinion, it all went downhill just like it did when President George W. Bush declared “Mission Accomplished” in Iraq before said mission was actually “accomplished” and the hard-fought for peace could be kept. And the negative feedback from many began...something Trump did not expect what with disengaging the U.S. from Syria being one of his campaign promises now kept. But why all the negativity and why is it still ongoing... because...to put it bluntly...Gen. Mattis is right in that ISIS is not defeated in Syria no matter our president's words to the contrary for it's been estimated that there are now between 12,000-14,000 ISIS fighters and their supporters in Syria and Iraq “sleeping,” if you will, waiting to be wakened once we pullout of Syria. And while ISIS' reputation has somewhat been compromised and its ability to recruit new members slowed down to some degree, know they are still capable of recouping both their reputation and territory lost in the what will be the relative vacuum left by the U.S. withdrawal...a withdrawal that will be complete within 60 to 100 days from my writing this very article. And with ISIS being able to regroup, reorganize, and fight on by using what is known as the “swarm technique”...as in overwhelming the defenses or lack of defenses of their principal targets what with U.S. troops then being gone and doing so via synchronization of its members and operatives...ISIS will be able to wreck havoc once again not just in Syria but throughout the Middle East and Europe as well, and possibly even bringing that havoc here to America's shores...as in another 9/11 but this time ISIS-style. So while Sen. Graham is more than just a bit correct in his saying that President Trump's decision does indeed make the U.S. "dramatically less safe," I'll now bring something or should I say someone into the mix that few are speaking of...the Kurds. With our withdrawal the Kurds will be left like lambs to the slaughter no matter that it has been they who have helped assure that key ground progress to date has been made against ISIS in Syria and done so with the help of American airpower...which we still don't know if that too will be fully or partially withdrawn once our troops are gone. Simply, if not for the Kurds, Syria would now most likely not be under Russian control as many feared but under far more dangerous Iranian control. And it's the Kurds...brave warriors who have stood by America throughout the long years of our engagement in the Middle East...who I believe are being left to fend for themselves...not deliberately by President Trump of course but because our president does not fully understand that those he is now putting his faith in are those with fingers crossed behind their backs. And again, here I'm speaking to Turkey and its islamist leader Recep Erdogan who will see to it that Syria's Kurdish militias are slaughtered by Turkish military power within a very short period of time, after all Turkey tried it before. Remember back to January 20, 2018 when Erdogan launched a major air and ground offensive against the Kurdish Peoples Protection Unit (YPG) in Afrin, Syria...they failed then but they will not fail now...not with Erdogan publicly vowing just two weeks ago to “drive out” the U.S.-backed Kurdish militias from Syria. And if this happens...as many Kurds fear...it will be on America's head for it's our presence in Syria that is keeping the Kurds safe from Erdogan's “revenge”...with “revenge” being the operative word. Because Erdogan is not only not a friend of the Kurds but he is also not a friend to the U.S. as witnessed by these very words he said right before launching the above stated attack in Afrin, “A country we call an ally (the U.S.) is insisting on forming a terror army on our borders...what can that terror army target but Turkey? Our mission is to strangle it before it’s even born.” And this is something President Trump should have known, along with the fact that once our military is gone from Syria, Turkey will most likely invade again and this time successfully occupy the border zone the Kurds currently hold...the very area separating Syria from Turkey. And Trump's not seeing this as fact is truly sad because if not for the Kurds the retaking of Kobani...the supposed turning point in the campaign to defeat ISIS in Syria...might not have happened nor might the retaking of the Arab city of Raqqa. And President Trump needs a reminder that the success in Raqqa is what afforded U.S. deployed Kurdish fighters in the Deir al-Zor province the ability to “liberate” Syria’s main oilfields from ISIS control, which in turn led to our Kurdish allies controlling over 25 per cent of Syria's territory. Now also remember that it was Recep Erdogan himself who said a little over a year ago that, “Turkey will never accept a U.S. alliance with the Kurds,” and that Syria's Kurdish militias...known as the People’s Protection Units (YPG)...the military wing of the Kurdish Democratic Union Party...are nothing but a direct offshoot of the Kurdistan Workers’ Party (PKK)...the very party Erdogan still claims is a terror group, a major threat to Turkey’s security, and a drain on its economy...a drain to date of between $300 to $450 billion (U.S.), mostly spent on military costs. And so Turkey's battle continues on with the Kurds...who are mostly secular or Christian...and who want an independent and autonomous Kurdish state where they can live free from persecution by those that surround them. Fighting for decades against both Turkey's repressive government and Turkey's refusing to give up any of the disputed territory between Syria and Turkey for a said free Kurdish state (Kurdistan) has led Turkish political analyst Hoshang Waziri to say that the Kurds recent territorial gains in Syria along Turkey’s border, coupled with their increasing political legitimacy in the eyes of the West, has made the Kurds a bigger threat to Turkey in general than ISIS is in specific. In other words, to Recep Erdogan ISIS is America's war not Turkey's. And yet this is the country and it's leader that President Trump mistakenly believes will help in the fight against ISIS returning to Syria when it's the Kurds who Turkey cares more about defeating than they do about defeating ISIS...who truthfully are their islamic brethren in arms. Defeating the Kurds in Syria translates into defeating Kurdish opposition groups in Turkey or so Erdogan thinks. So while the Kurds are U.S. allies they did keep some lines of communication open with Damascus because of the dead-end with Turkey. And with the Kurds wanting autonomy in the regions of Syria that they currently hold and with Damascus of course seeing this as not doable, political experts now believe that the only way to prevent a Turkish invasion of Syria...an invasion whose prime goal is to eliminate the Kurds...is to use the U.S. withdrawal as the time frame by which to revert Syria back to the way it was before its civil war began, And this means the Kurds would not only have to return all currently held territory to Bashir al-Assad's government rule, but that they would also have to physically vacate the border zone and submit to Syrian army command and control. Also, as per Turkey's wishes, the Kurds would have to stop speaking of Rojava (The Democratic Federation of Northern Syria (DFNS) that was and still is referred to as Rojava), and remove Kurdish flags and portraits of opposition leader Abdullah Öcalan in exchange for restoring Syrian sovereignty along its northern border with Turkey. In other words do as Turkey wants and as Damascus demands or Turkey will invade the border and Damascus will look away as the Kurds are slaughtered...self-serving political blackmail if you ask me. And President Trump should know all this...and maybe he does...yet he still decided to withdraw American ground troops from Syria...possibly on Erdogan's advice...thus leaving our Kurdish allies in eminent danger. But there is an option...a truly face-saving option... that could still be implemented before the 100-day timetable for our departure is reached, no matter Trump's stating that he will pound ISIS from Iraq if need be. And that option is to rescind the withdrawal order...to hell with Erdogan...and relocate the 2,000 American troops on the ground, along with their heavy equipment, to the Kurdish held side of the Syrian/Turkish border. Not only would their presence be a strong show of force but it would send a strong message, especially to Turkey, that America does not abandon those who stood by her...Rand Paul's version of isolationism be damned. And it's that very show of force that would keep Erdogan and his government forces in check. And why...because Recep Erdogan is smart enough to know that if he dared to tangle with American forces he'd be tangling with America herself, thus possibly risking the escalation of what still is a regional war and turning it into a war with America proper...a war that most surely would not end well for Turkey. And while the Kurds are of prime concern, as they should be, there are other countries our troop withdrawal will affect...key of which is our staunchest ally Israel for Israel shares a highly contentious border with Syria...as in the Golan Heights. And while Israeli Prime Minister Benjamin Netanyahu has stated that our military withdrawal from Syria will not affect Israel's "existing policy" towards Syria, he let it be known that Israel will continue its campaign against Iran's attempts to “militarily entrench itself in Syria” and that Israeli military actions will be “expanded” if need be. If need be being if Israel's security is breached. However, Netanyahu clearly let it be known that Israel's cooperation with the U.S. will continue “in full” in the areas of “operations, intelligence and many other security spheres," which does sound good in theory but will it play out in reality. That's something we have to wait and see for Russia's presence in Syria has created a scenario in which Israel was basically forced into a dialogue with the Kremlin in order to prevent friction between their two countries, with the hopes that Russia understands Israel's security needs. So while it now seems that Russia does understand, that understanding is causing a major rift between Russia and Iran with Israel being the cause of the rift, Syria being the recipient of the rift's fallout, and Russia possibly being the rift's biggest loser of all for Russia will never secure as their own the much wanted Port at Tarsus if Iran was ever to gain control of Syria. And while many will not admit it, it's our presence in Syria and our alliance with the Kurds that is keeping Iran somewhat in check. Now add in that while many world leaders continue to talk tough about Iran, we must never forget that Russia is still a key player in the Syrian game. But no matter if it's because of Russia or because of Iran the fact remains that leaving Syria at this point in time should not be an option for us. Too much is at stake for our president to make a decision based upon misguided advice...advice which has us not only abandoning those who helped us the most, but has us kowtowing to both isolationists at home and Levant seekers abroad, which could possibly trigger an even broader conflict that very well might be the downfall of us all. So like I said in the beginning, I will continue to support my president even while I do not agree with him on this issue, but I do hope President Trump realizes that not only is his withdrawal order wrong on so many critical levels, but that it appears he's been “had” by Recep Erdogan, a man who is a master in the art of taqiyya...need I say more. 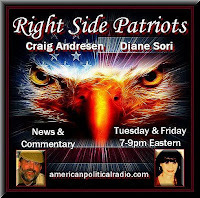 For more political commentary please visit my RIGHT SIDE PATRIOTS partner Craig Andresen's blog The National Patriot to read his latest article .